RACING THROUGH THE DECK OF FAME... your team competes in 3 fun-filled rounds to guess the most celebrities. TIME IS TICKING... and you're scrambling to get your partner to identify the name on your card. Got it right? Grab another! THEY HAD AT LEAST 15 MINUTES OF FAME... You have 30 seconds. Do whatever it takes to guess the most celebrities before... Time's Up! The party-perfect celebrity charades game that builds the laughter and excitement in three hilarious rounds. You have 30 seconds to get your team to guess as many celebrity names in the Deck of Fame as possible. Round 1, say or do anything; Round 2, use just one word; and Round 3, gestures only ... no words allowed! Comes with over 1000 names, an electronic timer, PLUS rules for a new 4th round of "freeze-frame" fun and laughter! 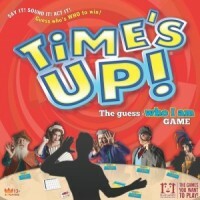 Add a Review for "Time’s Up! Deluxe (Second Edition)"